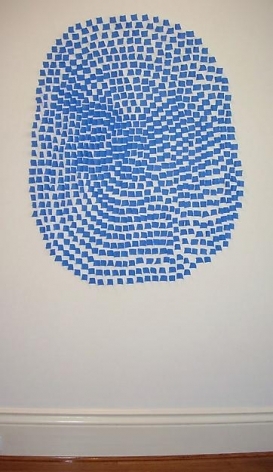 Anthony Meier Fine Arts is pleased to announce a solo exhibition of new work by Tony Feher. 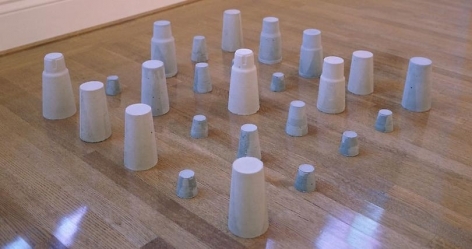 Exhibiting at the gallery for the third time, Feher’s work continues to be increasingly ambitious in scale and concept. 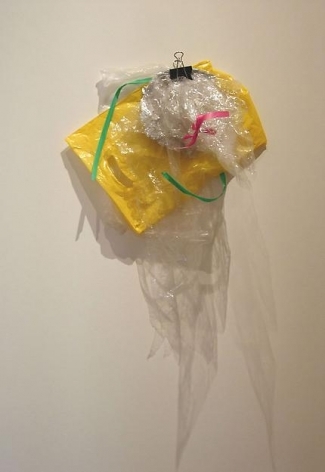 Formal characteristics in Feher’s work vary greatly. Although all pieces feature a use of found, discarded or unconventional everyday materials, their destinations take many forms. 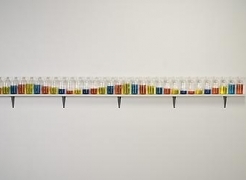 The constant in Feher’s work is the search for beauty. 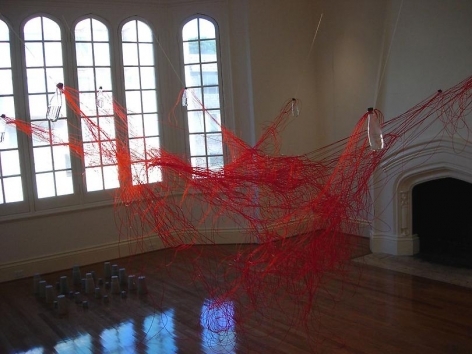 The works transcend their ordinary components, making the pieces much more than the sum of their parts. 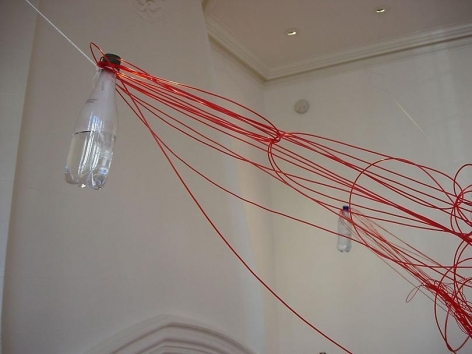 The front gallery features a near-full room installation of luminous red weed whacker line, tangled around water bottles descending from the crown molding via hangers and string. 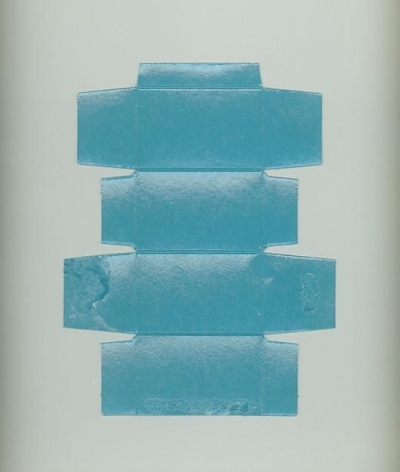 The weed whacker piece shares space in the gallery with a pristine tower of variously sized and shaped stacked jars, each jar holding a small, dayglow rubber ball; a grid of cement sculptures formed from the interiors of plastic cups; and an airy circle of blue painters’ tape applied directly to the wall. 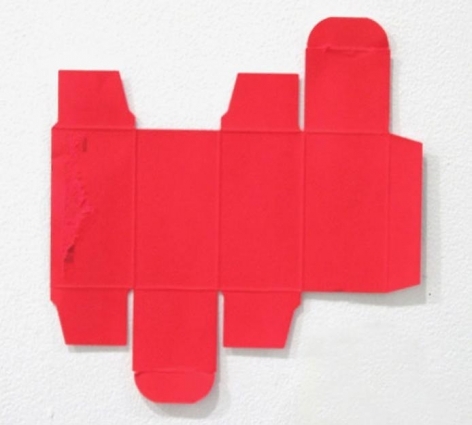 Feher understands the essential balance between positive and negative space. The seeming innocence and purity of form in his work obscure a tension and depth that hover below the surface level. Feher can, in essence, make something out of nothing. And that something is substantial, gorgeous and true. 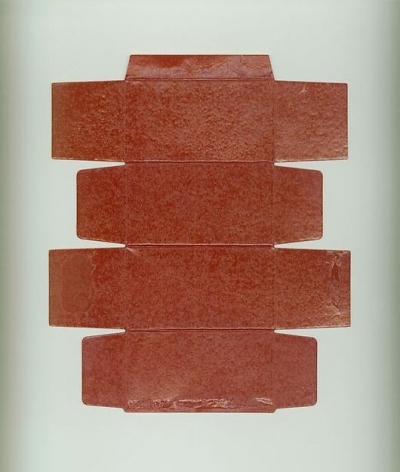 Along with John Chamberlain, Tony Feher is a current exhibiting artist at the Chinati Foundation in Marfa, TX. 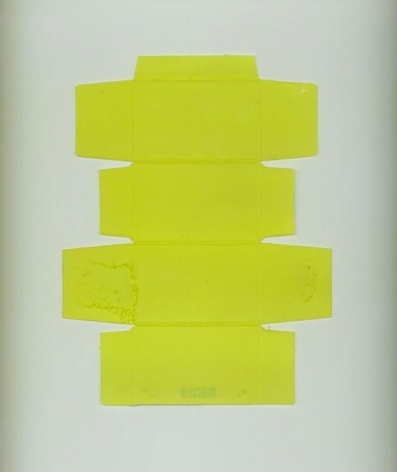 His works will be on view through May 2006.